Motivated by a passion for financial planning, we founded Beratung Advisors in 2016 to empower clients to make informed financial decisions in order to live fulfilling lives. 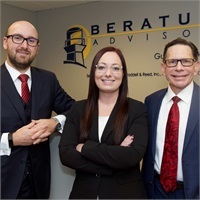 Our name, “Beratung,” is the German word for advice, guidance, or consultation. It reflects our belief that financial planning should be a collaborative process. We chose a lighthouse for our logo to represent the guidance we provide for our clients. As a lighthouse guides ships through uncertain waters to the harbor, we strive to guide our clients from financial uncertainty towards their financial goals. Within the lighthouse, a cross reflects our founder's Christian values. Together, our name and logo constantly remind us of why our firm was founded. Our Mission Statement guides the decisions we make, while our Core Values define our culture. Empower Clients to Make Informed Financial Decisions. to pursue their goals and live a fulfilling life. Beratung Advisors was established as a Christian based company. Our founder's faith and beliefs are the root of how we operate and shapes our culture and our core values.